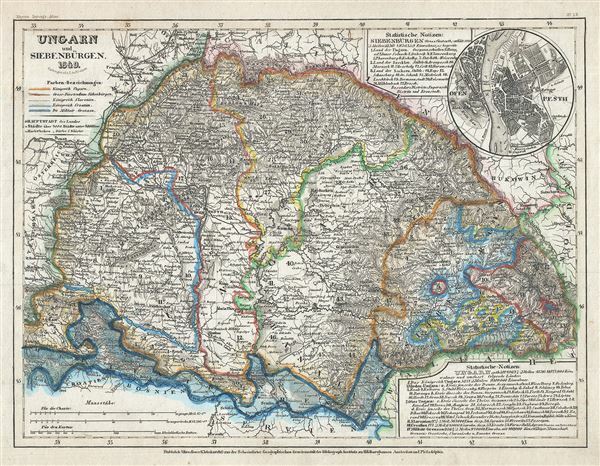 This is a scarce 1849 map of Hungary and Transylvania (Romania) by Joseph Meyer. It includes the modern day nations of Hungary, Romania, Slovakia, Croatia and Serbia. Throughout, the map identifies numerous cities, towns, rivers, mountains and assortment of additional topographical details. Two tables of statistics are also featured. The map also includes an inset of the cities of Buda and Pest (These were separate cities, until in 1873, they were officially combined into the city of Budapest). In 1849, the year this map was made, Hungary was in the midst of the Hungarian Revolution of 1848, a fight to gain independence from the Austrian Empire under Habsburg control. Romania however rejected Hungary's offer to join the war against the Habsburgs and in turn rose against them. Eventually Russia's Tsar Nicholas I aided the Austrians and the Hungarian was forced to surrender. It was not until the Austro-Hungarian Compromise of 1867, that Transylvania was reincorporated in Hungary and a 'dual monarchy' of Austria-Hungary was established. This map was issued as plate no. 13 in Meyer's Zeitung Atlas. Although all the maps in this atlas are not individually dated, the title page and maps were often updated while the imprint with the date was not, causing confusion to the exact date for some of the maps. Moreover some maps in the atlas were taped in at a later date as an update to the atlas. We have dated the maps in this collection to the best of our ability. Very good. Minor toning and spotting at places.